The Genius G-Pen F610 is a slim, cheap and large USB tablet. It has pressure levels that compete with the best and even sports the highly useful Hot Key system. For general-purpose use this piece of kit is perfect. You can customise your hot keys to suit your needs and carry the tablet wherever you go. It'll even support Vista and Apple Macs. One flaw is that the pen uses an AAA battery. This is a shame but at least it's wireless, which gives the user some freedom. Furthermore, the G-Pen requires its own custom drivers; it doesn't work as a basic human interface device. The G-Pen F610 also comes with Ulead PhotoImpact, suggesting that the tablet is suitable for art purposes. However, tracing on a 4:3 ratio monitor at a standard resolution reveals that the product is designed for widescreen resolutions and there's no way to change either the active area size or how your pen movements are interpreted. This lack of features regarding the active pen area to screen transition renders the tablet unusable on a 4:3 monitor for anything other than a mouse replacement. 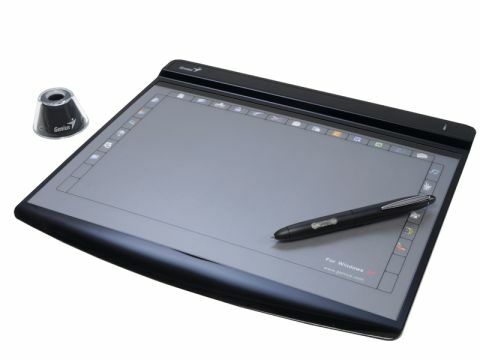 This is not what most users who are willing to splash out a good £70 on a graphics tablet are after. If you're not a widescreen buff or aren't too fussed with tracing and can handle only watching the screen while you draw then the G-Pen F610 is a sound solution. If you don't have a widescreen monitor though, then you might want to give this tablet a miss.